Why does Mark Carney want bigger banker bonuses? 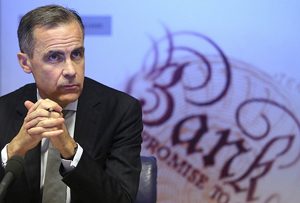 Band of England governor Mark Carney says more of bankers' pay should be at risk. Is anybody really happy with the state of bankers’ pay? Mark Carney certainly isn’t. In his 2014 Monetary Authority of Singapore lecture last night, the governor of the Bank of England said all those fines aren’t enough and that bankers’ pay needs an overhaul. Other than being a worrying sign that apple metaphors are spreading like the plague at the Bank of England, this is a serious warning to the City. Carney said that fines haven’t worked to produce a fair system that the public can trust, and that there needs to be a deeper cultural and institutional reform. But what about bankers’ bonuses? Hasn’t the EU cap on bonuses at 100% of salary (200% if the board’s feeling generous) brought this reform about? Apparently not. The cap has had the ‘undesirable effect of limiting the scale of remuneration to be cut back’, Carney said. Essentially, if too much of bankers’ pay is fixed in the basic salary, there’s supposedly no risk for the monocled fatcats if their banks perform badly. Other than pride, reputation and angry shareholders, of course, but Carney didn’t mention them. Carney seems to support a greater percentage of bankers’ pay being variable. This isn’t to say he’s backing bigger bonuses as traditionally understood (that really wouldn’t go down well). Rather, he’s interested in ‘payment in instruments other than cash’, saying New York Federal Reserve Bank President Bill Dudley’s idea of ‘performance bonds is worthy of investigation as a potentially elegant solution’. This would entail bankers being paid in debt that would be reduced in the event of fines, effectively tying them to the bank’s performance, but with additional exposure to bad practice. It’s not a concrete proposal, but it certainly means he’s hovering around the idea. Whether it would fly with the EU, which has explicitly capped all forms of variable pay, is another question. Then again, with a possible Brexit referendum looming, perhaps the EU might be sensitive enough to avoid another fight with the UK and back down. Stranger things have happened.